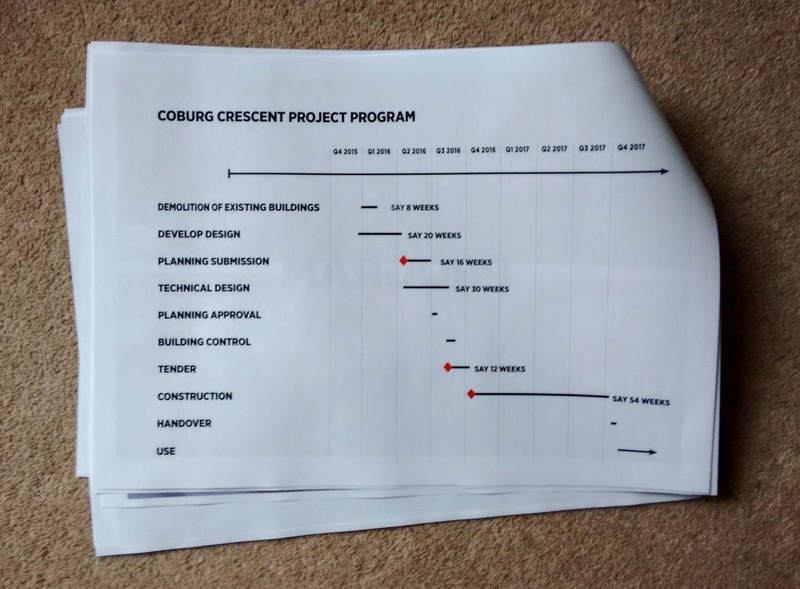 On 4th May there was another public meeting about the new building on Coburg Crescent. As usual, this took place at Laburnum Hall on the Cheshire Estate. The meeting was hosted by Fiona Connolly – Lambeth’s Director of Adult Social Care – and representatives from C.F. Møller Architects. Notes on this meeting and two meetings held earlier in the day can be downloaded here. 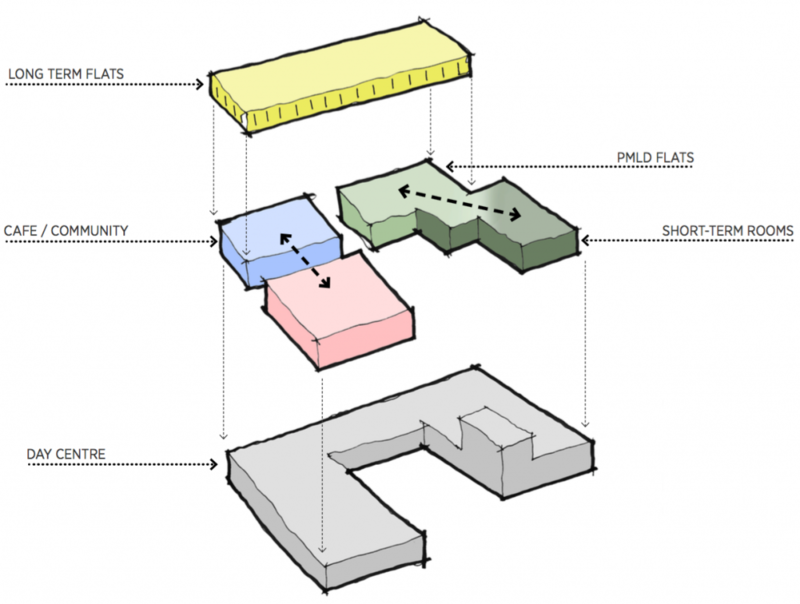 Design strategy for the new building, as presented in January 2017. The next opportunity to see some details of the plans will be the PRERA General Meeting tommorrow. The next meeting with the architects will take place on 1st June at 7pm at Laburnum Hall. 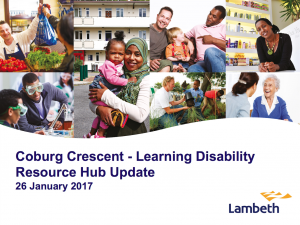 On 26th January 2017, a meeting was held at Laburnum Hall regarding the proposed “Learning Disability Resource Hub” development on Coburg Crescent. The meeting was chaired by Fiona Connolly (Director of Adult Social Care, Lambeth Council) and it was attended by Lambeth Council staff involved in the project, the architect, local councillors and local residents. The meeting was informative. 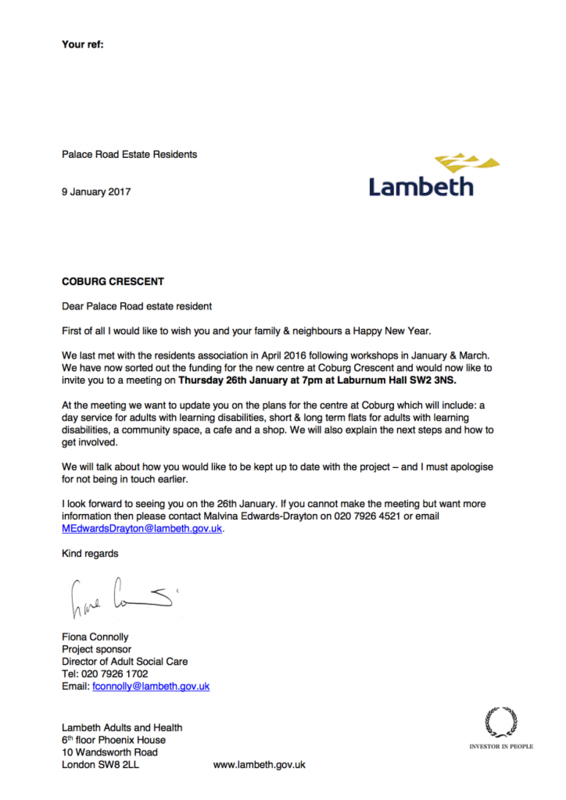 However, letters notifying Palace Road Estate residents of the meeting had only been posted through letterboxes the previous day and only a handful of residents attended. Residents and councillors emphasised to the council during the meeting that there must be plenty of notice of future meetings. This blog post provides a summary of the key points from the meeting. Further information is contained in the handouts provided by Lambeth Council and the architect’s firm (C.F. Møller). Minutes of the meeting are being produced by Lambeth Council and will be added to the blog in due course. What’s going to be in the new development? A cafe to provide snacks and meals to service users and at times for the local community. A new shop will also be built on the site. The council have stated that it is a priority to keep some kind of continuous shop facility open throughout the construction process. The development is subject to planning permission and the council propose to submit the planning application in late May/early June 2017. The council stated that there would be consultation with residents on the detail of the design before submission. Construction is planned to commence in winter 2017 with the building opening for use in spring 2019. Two members of the PRERA committee have received emails notifying them of a meeting on 26th January 2017. The emails had a letter attached that appears to directed to all residents of the estate – see below. Our community hall and the associated buildings (3, 5 and 7 Coburg Crescent) have now been completely demolished. Residents may now be wondering what the next step is. We will provide updates through this website, as and when we get them from the council. On Tuesday 19th April 2016 PRERA held its first general meeting. The meeting was well attended, both by residents and by visitors, including councillors, council officers, guests from St. Martin’s Estate TRA and an architect. Franny, our Vice Chair, welcomed everyone to the meeting and then Rob gave a presentation that described what the committee has achieved so far and suggested things that the committee could do in the future. The committee then appealed for suggestions from the other residents. High charges levied on leaseholders for work carried out by the council. Work to the heating systems being of a low standard. A desire by leaseholders to upgrade their windows, but a concern that they may subsequently be charged for the cost of replacement windows again, when the council upgrades all the windows. A concern that Bushell Close may be neglected when problems are identified across the estate. Whether rent arrears could be paid off in instalments where these arrears had occurred due to the council making late adjustments of rent demands. The second half of the meeting covered the topic of the new resource centre for adults with learning disabilities. Fiona Connolly (Assistant Director of Adult Social Care) introduced the project to move the existing resource centre from Lambeth Walk to our estate. Rolf Nielsen, of the architects CF Møller, then gave a detailed presentation describing the proposals for the new building. These proposals had evolved from those presented at an earlier meeting to include a possible extra storey and up to eight flats for private sale or rent. The meeting then concluded, but lively discussions continued amongst those who had attended. Fiona Connolly described the needs of the users of the new building (adults with learning disabilities) and how the council intends to consult with residents of the estate. Initial discussions about the project have included ideas such as a day centre, a small amount of residential accommodation and potentially a cafe that will be open to all. These are very much early stage ideas and nothing has been signed off or agreed by Lambeth Council as yet. Rolf Nielsen gave a presentation to describe the architectural experience of his practice and their ideas for the design of the resource centre. He suggested a two-storey design with the ground floor (the level of the exisiting shop) dedicated to a day centre. The 1st floor (the level of Palace Road) might contain residential units and a larger space to accommodate meeting room. This larger space might contain a cafe and be provided with a moveable partition, to allow it to be divided up for other uses. The next stage in the consultation will be a meeting on 9th February. This will involve four groups discussing the day service, employment, accommodation and community space. Representatives from PRERA will take part in the community space group. Let us know if you have any ideas or opinions that you would like to be shared at this meeting. The PRERA committee will continue to publish information about the resource centre on this website as we get it. 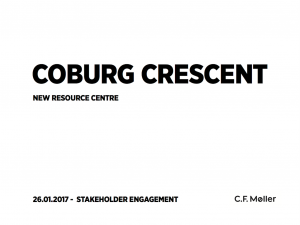 To search for blog entries on the resource centre, click here or on the words “Resource centre” under the title of this post.